Save $50.00 On These Great Folding Carts. Our light weight folding utility carts take seconds to change from folded to loaded. These easy folding rolling carts are great on sand and will easily hold a cooler bin of fish, fishing rig and kite tube. The collapsible folding carts are easily stored in the boot when collapsed and are loaded with plenty of straps to secure the load. 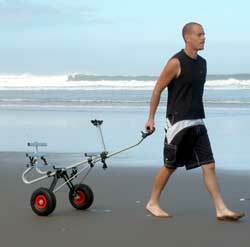 Great Folding Carts - The easy rolling beach cart. Only 20 left so get in while stocks last! 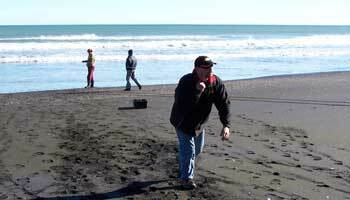 We left Auckland and headed south for our first ever kite fishing trip to Mokau on Friday June 2nd. What an amazing place to spend a few days fishing, it was like going back in time about 20 years, the locals there are just so friendly and down to earth and their hospitality beyond belief. Shortly after settling in at the Whitebait Inn we met up with Geoff and Heidi Preston and Jeff and Anna Allen, a few of the local kitefishing experts. Jeff and Anna totally blew us away by handing over a set of keys to a Nissan Terrano 4x4, a beast the locals refer to as "Big Red". Incredibly we were told that this was for our personal use for the entire week we were visiting. 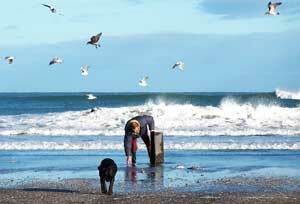 Arriving on Seaview Beach in the early morning there were eight to 10 other local fishers on the beach. The sea was so flat calm you could have easily launched a 12 foot tinny. A steady offshore wind blew at 10 to 12 knots. Geoff and Heidi set up their longline rig while Petra and I watched with great amusement as their dog Coco took over his role as official bird scarer. Obviously he'd done this before. Apparently, according to Geoff, bottom longline rigs are the norm here in Mokau because of the unusual wind patterns. Being Aucklander's though, we figured west coast conditions were the same everywhere so we proceeded to set up our large 65kg dropper rig, much to the amazement of the locals, many of whom had never seen one before. We made several attempts with the Super kite. It should easily have been able to fish these winds and we couldn't work out why we were struggling to keep the kite up. 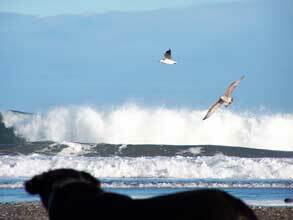 Above : Coco, the kite fishers best friend, doing his bit by chasing those bait gobbling seagulls away. 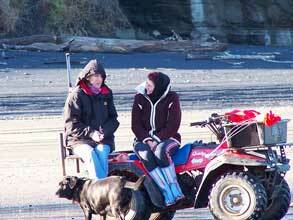 Above : Waiting while the gear fishes is a good time to relax and have a chat, although Coco is still not too sure if he should allow those pesky birds back on the beach yet! Enlightened by Geoff and Heidi, we were told of the local phenomenon. Amazingly, there are two distinct wind conditions in Mokau, so different in fact the locals rig their gear with two different settings on their kitelines. One is for the mornings and uses the Mokau easterly wind and the other for during the day if the wind is really blowing from the east. Even though the weather forecasts were mostly for light westerly winds, we experienced a good steady offshore easterly wind from 6:30am through to around 9:30am every day except our last. Incredibly, the Mokau wind almost guarantees one good set of around an hour and a half every morning providing you're on the beach very early, and the onshore wind is not too strong. 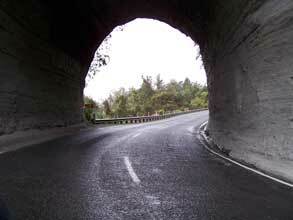 The Mokau easterly wind is caused by heavy cool night air rolling down off the mountains. This wind flow is not very deep, it actually has a ceiling height of around 80 meters above sea level. If you have your kites flying too high, they will fly up and park themselves above the wind and spend hours bouncing off the top of it without providing any useful pull. Pluming Surf Above : The forecast was southwest but, as dawn breaks, these pluming waves clearly show the Mokau easterly is stronger. By lowering the flying height of the kites in the morning you can tap into the wind stream and fish with the kites sitting just below the ceiling of the wind flow and they will pull constantly. During the days however, if a real easterly is blowing, the kite lines can be lengthened again to regain the extra height and wind strength needed to punch through the often-strong long shore currents. After a few modifications to our kiteline we launched our two-kite dropper rig powered by the Mega Mouth and Power Chute kites. I was using a mixture of large arrow squid and fresh kahawai for bait, (the locals net their own kahawai and mullet in the rivers at high tide). I also decided to use a two hook pilchard rig for the long back trace because the floating back trace usually catches the biggest fish of the day. 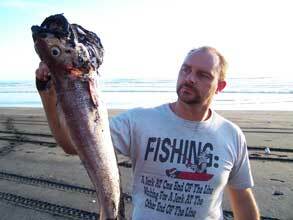 I baited the two hooks with a large squid head and most of the body. My kites were pulling like a freight train and towed our two kilometers of line and 25 hooks out in no time at all. I actually managed to get my gear set the full distance before Geoff had even reached 750 meters offshore with his kite longline rig. Above : I thought these were good fish on the first set but Geoff was surprised I wanted to keep anything this small. The locals were impressed and, after locking the reel off, it was just a matter of settling back to wait in anticipation. After hauling in our first set we were over the moon, we landed a beautiful 5kg snapper! Geoff Preston on the other hand appeared disappointed and tried to convince us to throw this "little fellow" back! No Way, we replied!!! While waiting for the second set to fish we soaked up some of the local knowledge and watched as other out of town kite fishers arrived on the beach around 9:00am, only to find that the winds were just too light by this stage to successfully launch their kites. Then it was time to haul in our second set. I'd heard that the fish here in Mokau only came in two sizes, large and extra large, but I was not prepared for what came next. As we hauled in, and just after a big snapper of around 8kg had just been landed, Geoff Preston spotted something. He jumped up and sprinted down to the water, charged out waist deep, before grabbing the fish of the trip, a massive 10.05kg snapper. Above : This was more like it! Two Mokau beauties taken from a single set of the big dropper rig. The snapper was taken on the long back trace, and to Geoff, who is not used to hauling dropper rigs, must have appeared to have got off and be floating free. This wasn't the case though, both hooks were securely in the fish and it was going nowhere! 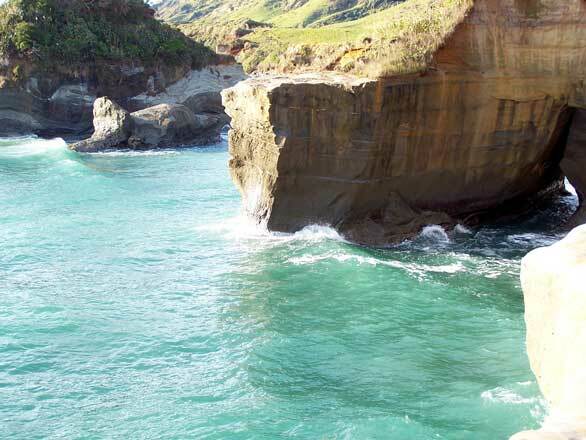 Our whole trip to Mokau was truly amazing. 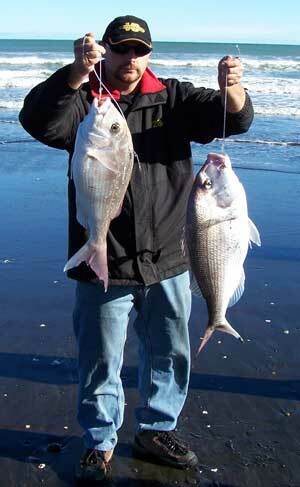 We managed to pull in snapper at 4.01kg, 5.kg, 6kg, 8kg, and a whopping 10.05kg over the week. Surprising to us, but a well known fact to locals, you only catch really big snapper here in the mornings, and almost all gurnard during the day. The gurnard off Mokau are a decent size, up to around 1.2kgs and there are plenty of red cod as well. Above : There were absolutely no problems with paddle crabs but they do have a lot of small to medium sized sharks. On one of the days there had been lots of rain and we didn't manage to catch any snapper. 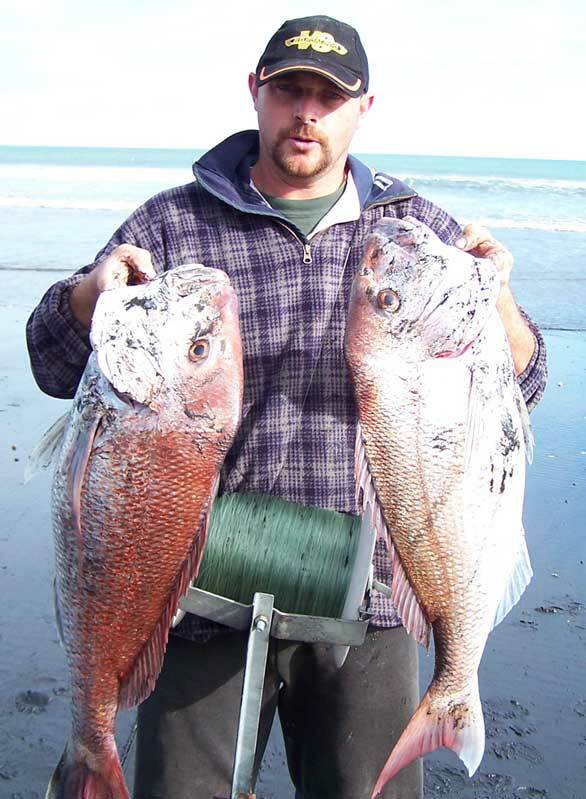 According to Geoff rain causes loads of debris to be washed out of both the Awakino and Mokau rivers, snapper are inclined to stay away until the rivers have calmed and the waters have cleared. 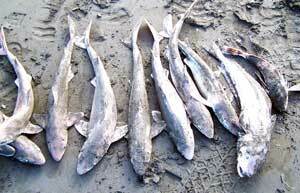 Above: There are several ledges the locals kite fish from when the wind is not straight off the main beach. I hope to try this next time I visit Mokau. Above : Even though the sea was mostly flat the odd big set of Tasman swells rolled in. I would like to thank Anna and Jeff Allen for the use of "BIG RED" and for their incredible hospitality. Thank you also to Heidi and Geoff Preston for all their help and invaluable information on the area and their very warm welcome. These people in my opinion are doing a fantastic job in promoting Mokau. Because of them I will always remember Mokau as the little town with the very big heart. Above Right : Catching red cod was a new experience for me. If anyone would like to do some amazing kitefishing with some awesome people I strongly recommend you get in touch with Geoff Preston, he is also the local agent for Paul's Fishing Kites, which is great if you need any spares while you are fishing there. Click the small map on the left of the main wind.co.nz page for your area.